Well, it seems that the Great Dallas Ice Storm of 2013 is coming to a close, thank the Lord. I'm sure that it will be something most Dallasites won't soon forget, recounting the tales of fallen trees and the lack of electricity for nearly 24 hours. It was armageddon, y'all. When you live in a climate that rarely sees cold temperatures or weather of any kind, the world stops and people lose their damn minds at the mention of "freezing rain". It's actually pretty entertaining. We passed the time by drinking screwdrivers and playing Trivial Pursuit with friends up the street, so it wasn't half bad. Wasn't that ice storm crazy?? I took advantage of the pretty scenery and took several outfit photos!! Your story is hilarious! Good for you, getting what you want. :) Loving your pretty colors in this outfit! Hey Meredith! OMG, it was so ridiculous and still is. The only thing worse than ice in Dallas is traffic during this type of weather. Hopefully you live outside of the loop, but I can't get anywhere within an hour. Glad to hear you took advantage of the scenery. can't wait to see your new posts! Hi Sarah. 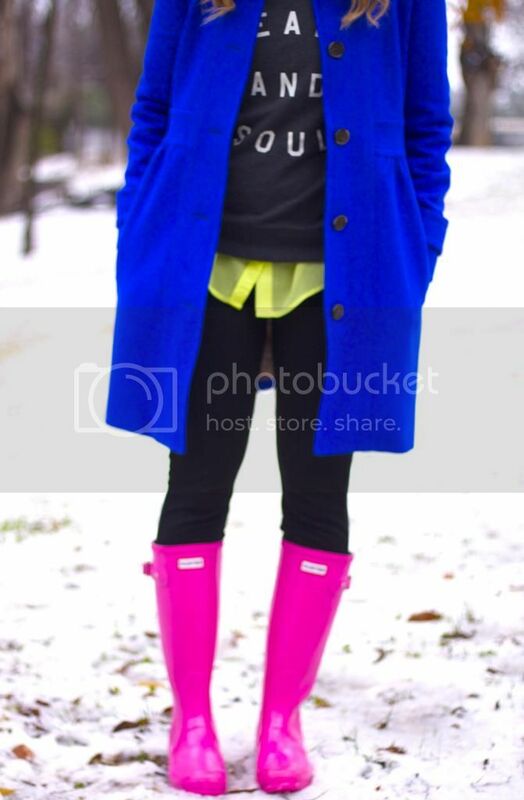 I have this same sweatshirt and I love how you styled it with pops of bright colors. It looks great! Thanks for the outfit inspiration! You are too sweet! Thanks for stopping by :) This sweatshirt is super cute. I have worn it about 37 times since I got it. Bringing out brights during the winter is all too important. LOVE this look. Visiting from the Friday Fancies Link up!